All is now set for the maiden edition of BrandCrunch Sessions, a breakfast learning session organised by BrandCrunch Nigeria, one of the nation’s premier online marketing news portal. According to the publisher of BrandCrunch, Mr. O’Lekan Babatunde, the maiden edition themed “Marketing in the era of Big Data: The Changing Paradigm”, will kick off by 9:30am on Thursday, August 10, 2017 at the Renaissance Hotel, Isaac John, Ikeja. 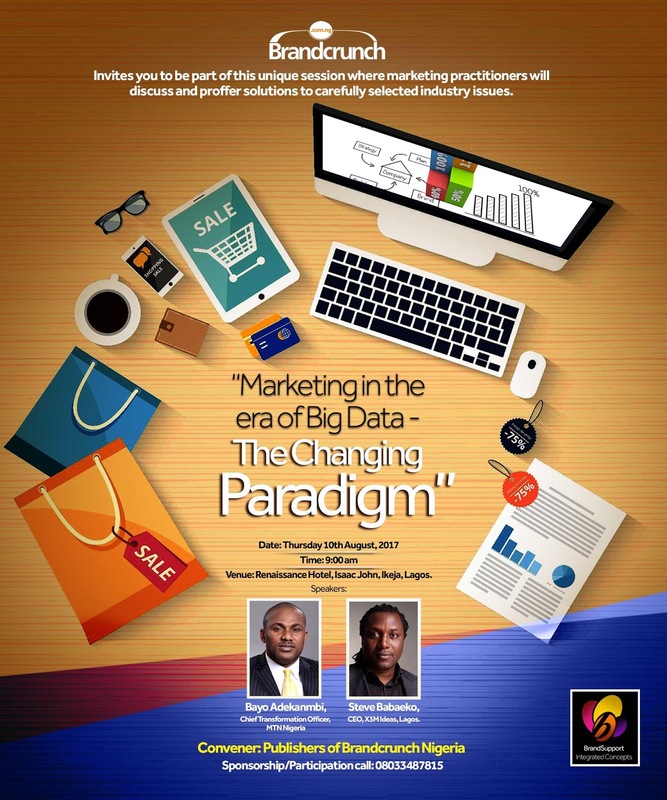 The pilot session will be facilitated by top-notch marketing professionals: Mr. Bayo Adekanmbi, Chief Transformation Officer of MTN Nigeria, and Mr. Steve Babaeko, Chief Creativity Officer/CEO, X3M Ideas. Each of the sessions will feature keynote presentations and the discussion of same by experts across industry, business government and non-governmental organizations. “The keynote addresses by our speakers, arguably some of the best in their respective industries will be subjected to discussions by key decision makers in business across industries in a robust session expected to broaden horizons, proffer solutions to issues and ultimately the way out of the present business quagmire” noted the Publisher. The portal’s new ‘look and feel’ reflects world-class standard in our offering to millions of visitors and also attests to our next growth phase which is to practically enhance our potential as a veritable influencer, a platform for the cross fertilization of ideas and knowledge sharing. Opportunities however, abound for organizations and brands to partner with BrandCrunch Sessions, Babatunde discloses. “It is our modest desire that like-minded organizations partner with us on this journey to contribute to the development and progress of the industry that sustains millions and keep the chain of production and consumers’ satisfaction oiled at all times”. Founded on the 11th of December, 2011, BrandCrunch.com.ng has consistently risen in value of offering and acceptance through regular exclusive news, analyses and prized information in its chosen genre which brings together the marketers and consumers alike.